All lips are different; if you are doing a portrait or a very realistic model you will loose a big part of the character of the person. 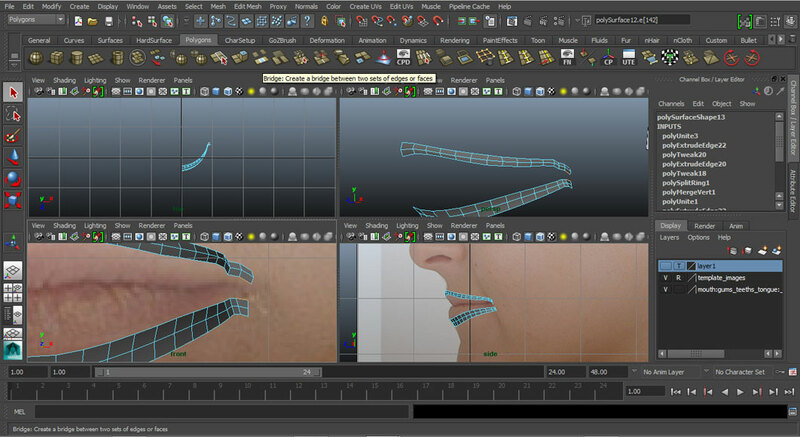 If you are rigging you will benefit from having a good lip model. 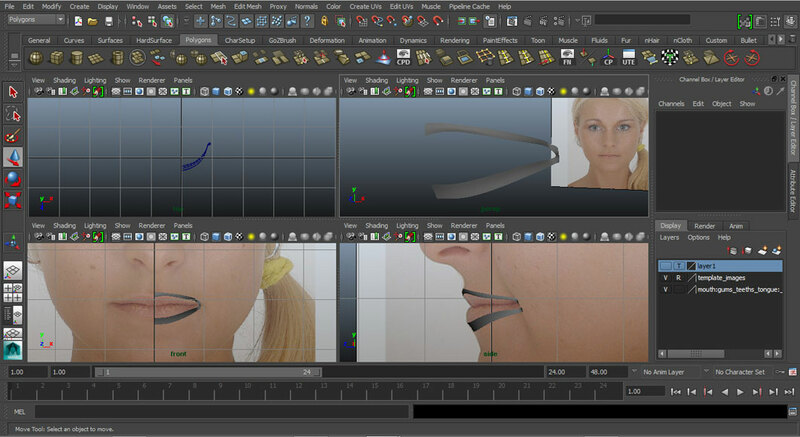 Having defined lips is incredibly useful when creating blending shapes and controls to move the mouth. 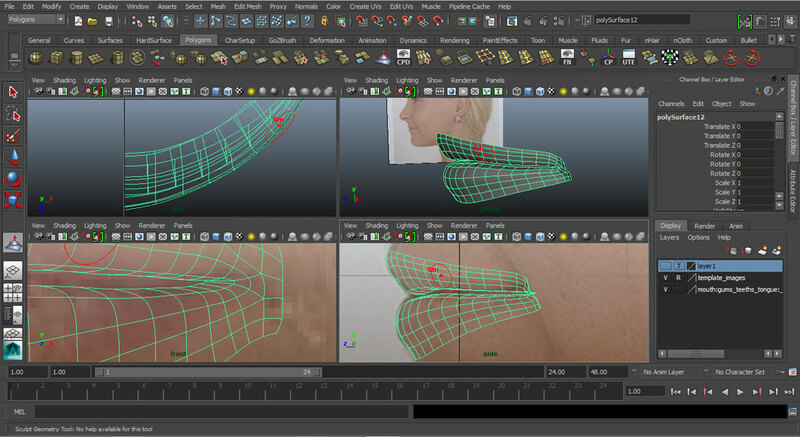 This technique allows you to have a very precise and easy to read model without the need of having lots of geometry. 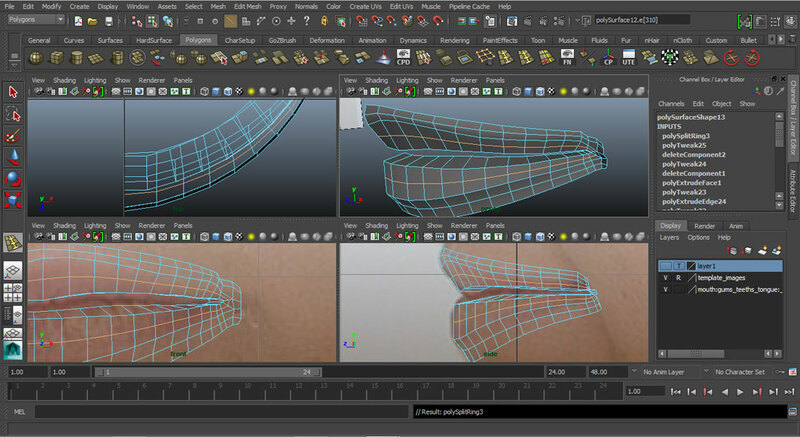 NOTE: this tutorial is done in Maya, however this is not a Maya tutorial as it doesn't reference a system that only works with the Autodesk program. 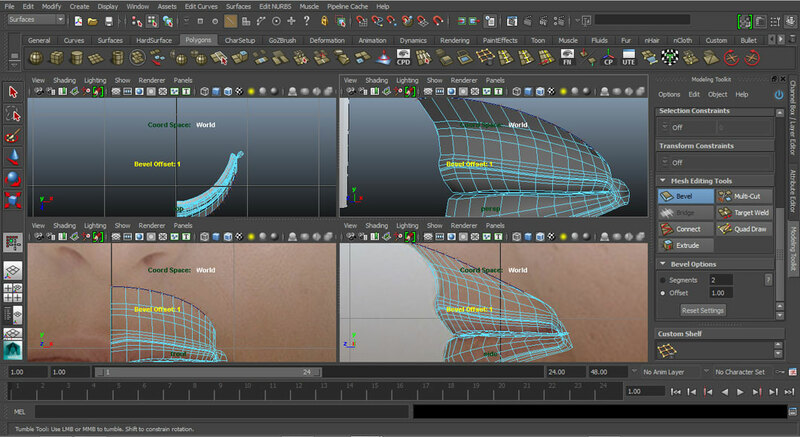 The concepts used can be applied in 3DS Max, Modo, Softimage, Houdini, etc., assuming that you know that program well enough that you can duplicate the Maya functions and processes in your respective software package. 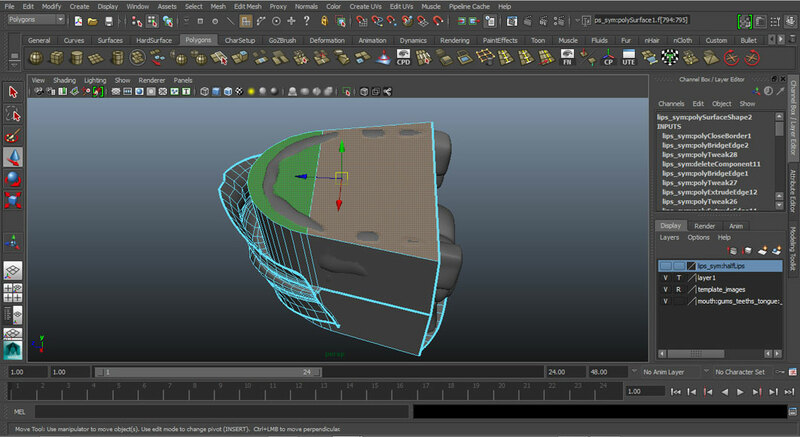 This tutorial assumes that you have a basic knowledge of 3d modelling and doesn't stop on basic details about modelling. 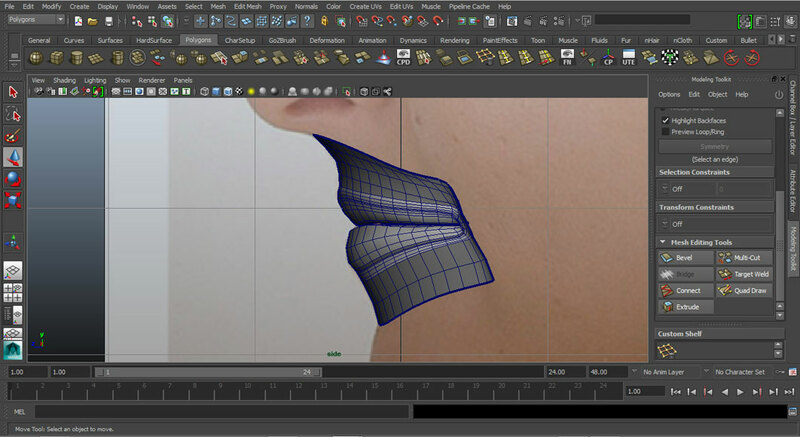 Another consideration is that this tutorial focuses on making the lips and ignores the rest of the head. You need to take this into account and adapt it to your whole model. This may mean changing the order of some operations or ignoring some steps altogether. 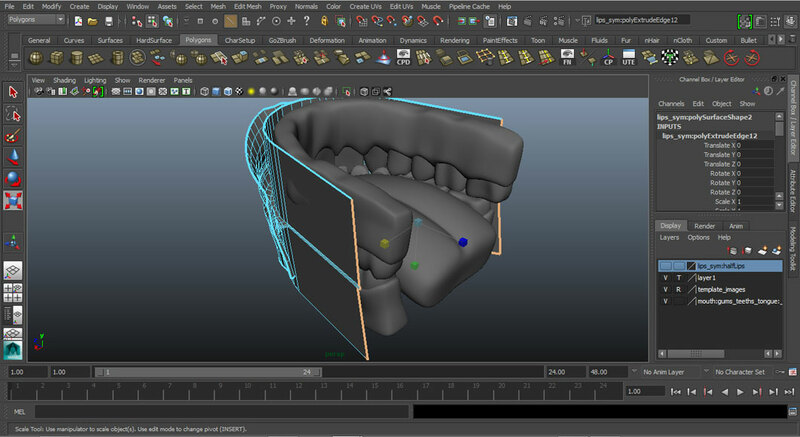 I also used a free teeth and gum 3d model. It's important to use this so you get the correct mouth curvature. You can find it here. 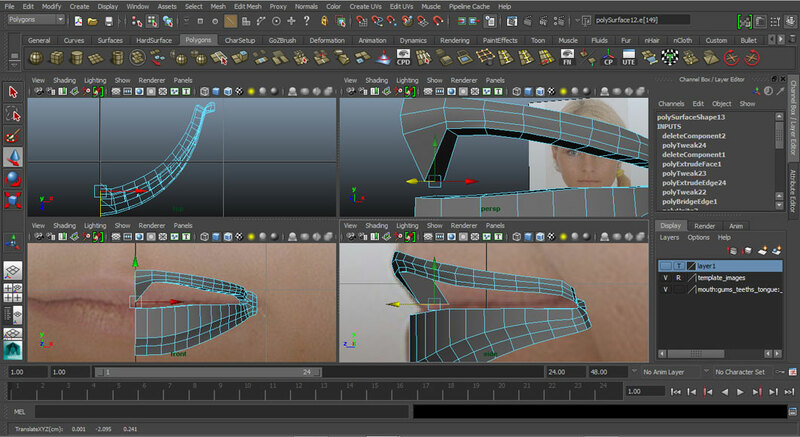 Add the side and front reference images to your scene. 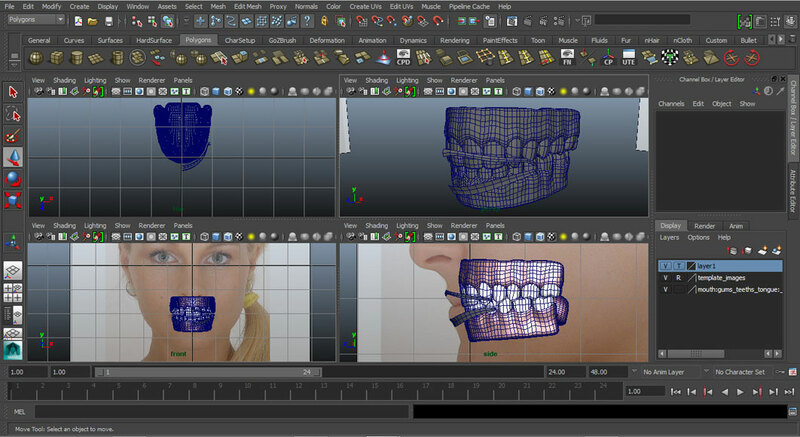 Then import your teeth-gum model (or proxy mesh). After this you need to take the crucial first step. Define the lines that create the the beginning of the upper and lower lip. 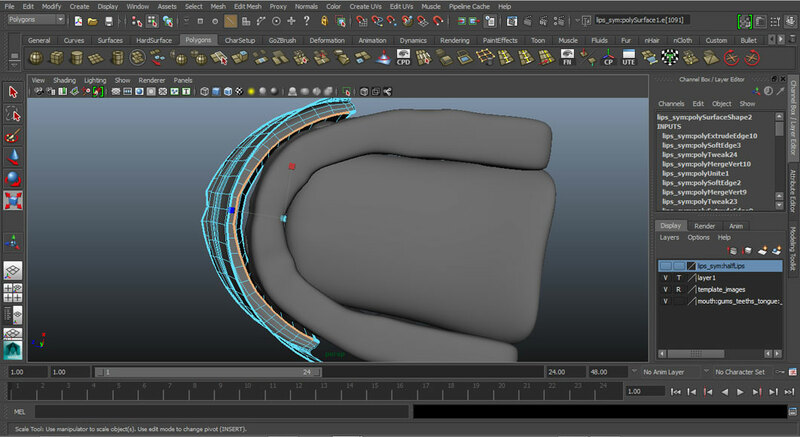 PART 1: Defining the basic shape. 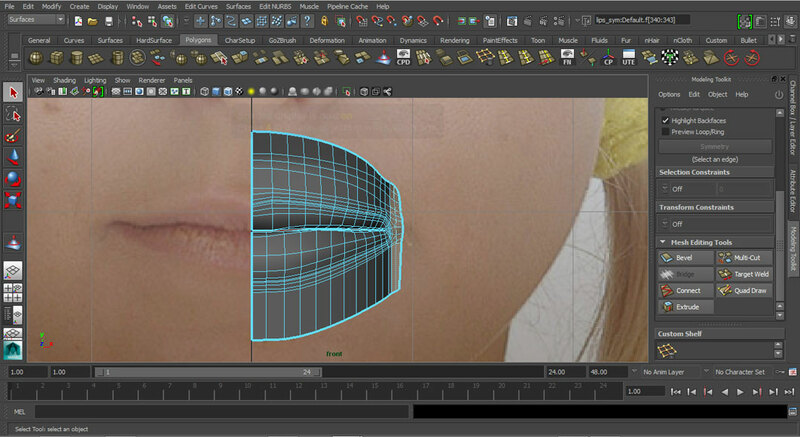 Making these lines are crucial as they define the lips. 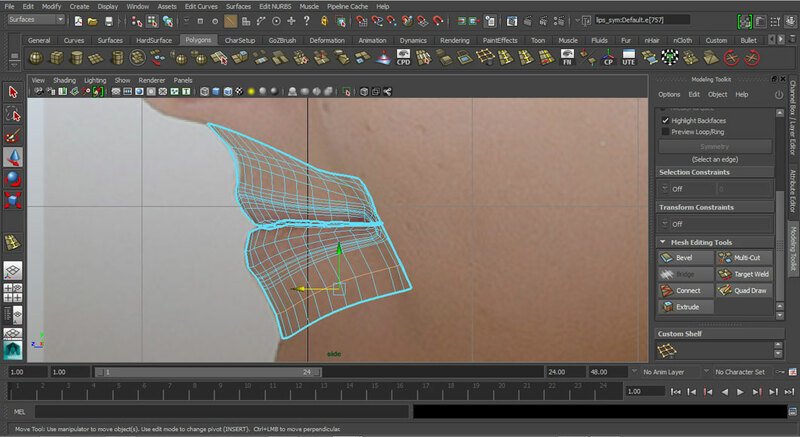 After setting up the reference images You need to create the reference lines as a polygon strip. 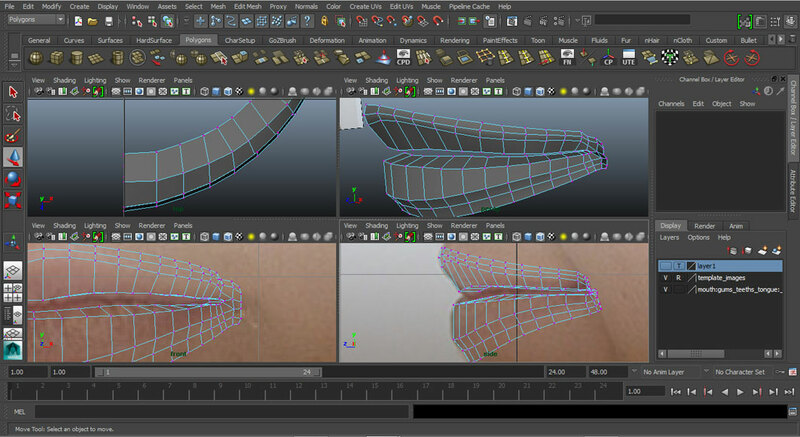 Extrude the lines you created outwards. This creates the frame of the lips. 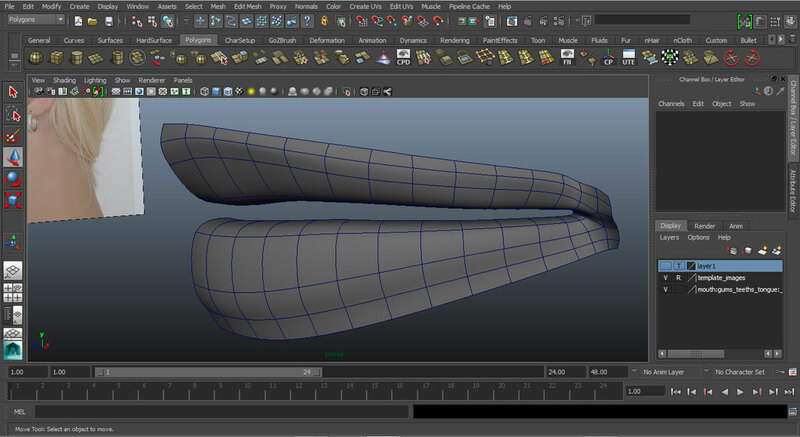 I created the basic shape and then inserted a loop to define the curvature more accurately. After you have the 2 arches, you need to unite them as a single object. 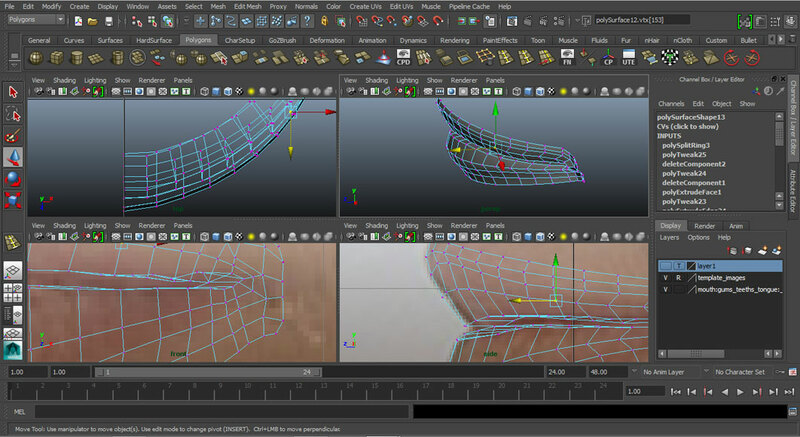 In Maya combine them and in Modo make sure they are part of the same layer mesh. Now you need to unite the 2 arches by the lower far edges. Bridge them with a face. This ends part 1. You should have the outer part of the lips. They define the basic shape. It should look similar to this. PART 2: Blocking the shape. Select the inner edge created by the 2 arches and extrude it backwards. This will form the base of the lips. 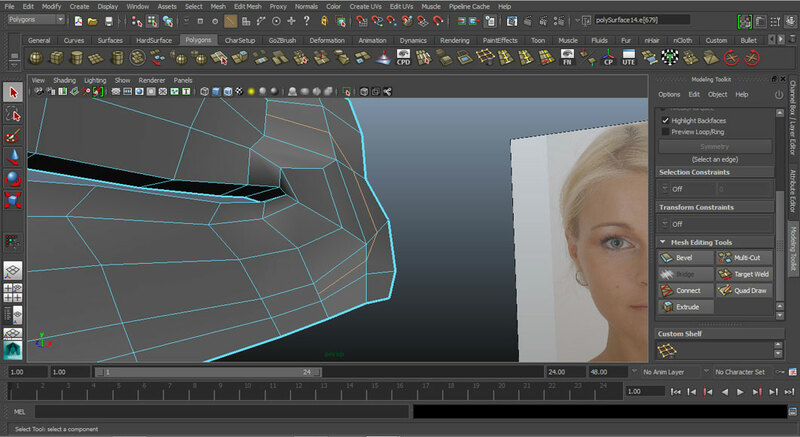 Now select the faces that you just created and extrude them inward the mouth. Here you will most likely get overlapping at the corner of the mouth. Don't worry we will fix that later. 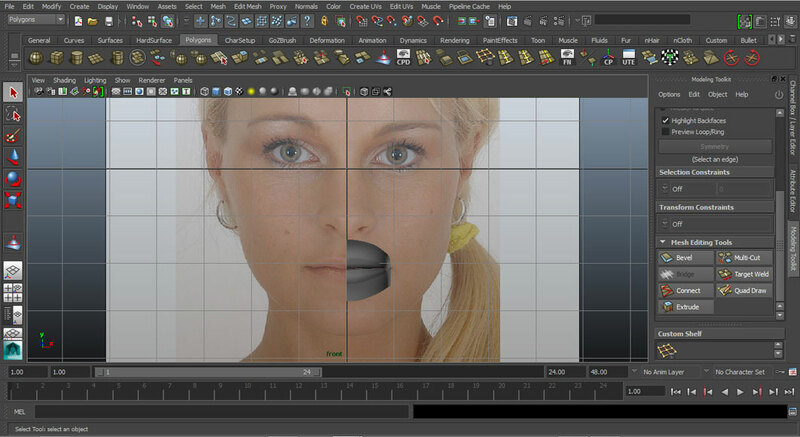 Delete the faces that are located at middle of the lips in a longitudinal way. When you mirror the lips you won't be able to connect the 2 parts if you have these faces. Select the faces located at the top of the bottom lip and move them upward. Adjust them so the follow the shape of your reference images. 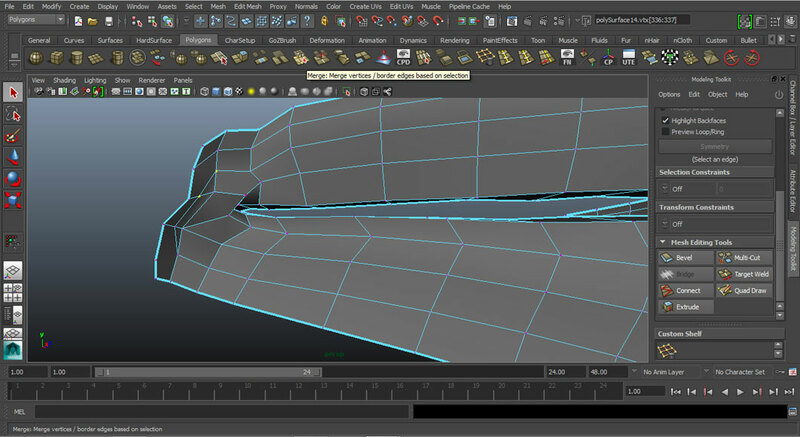 You can move the vertices of edges as desired. Now is time to fix the corner. This is a tedious process and there is no way around it. You should attempt to get a nice loop curve. Be patient and apply common sense. 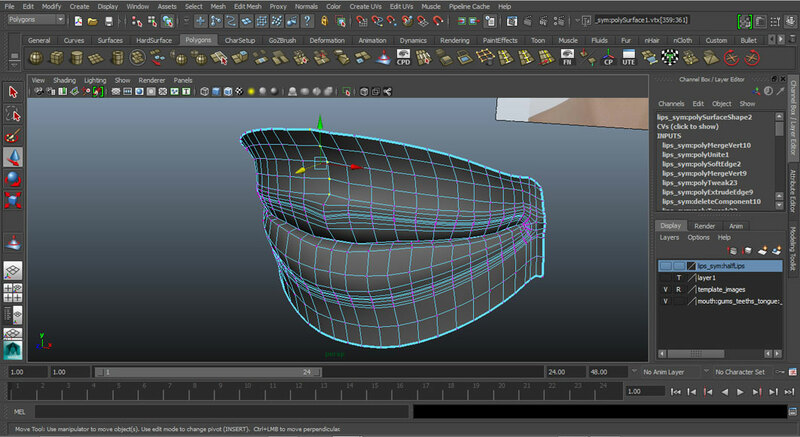 A tip I can offer you is that when making the mouth, it might be easier to separate temporarily the mouth from the whole model. Turn the camera so it looks backwards. Delete the back faces. 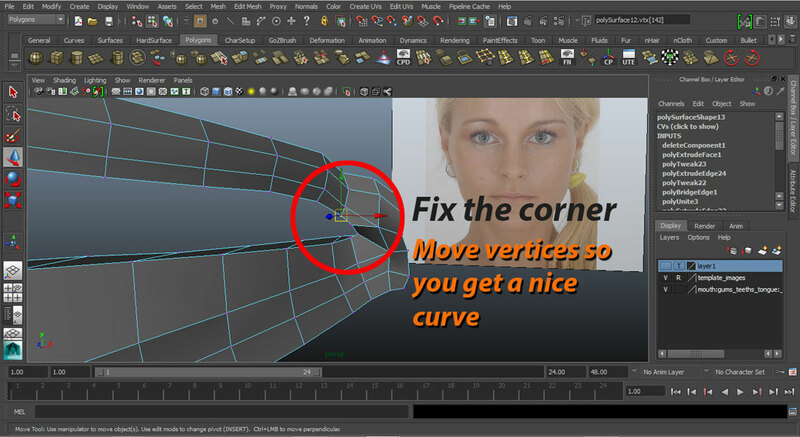 This will help you to accommodate the lip's vertices correctly. Look at you model from the top. 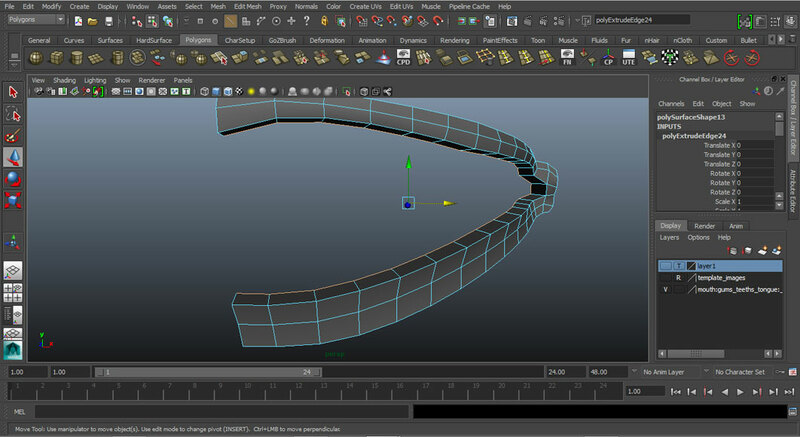 Make sure that you are positioning the vertices correctly in a horseshoe shape. You can use the teeth-gum model to help you do this correctly. This ends part 2. 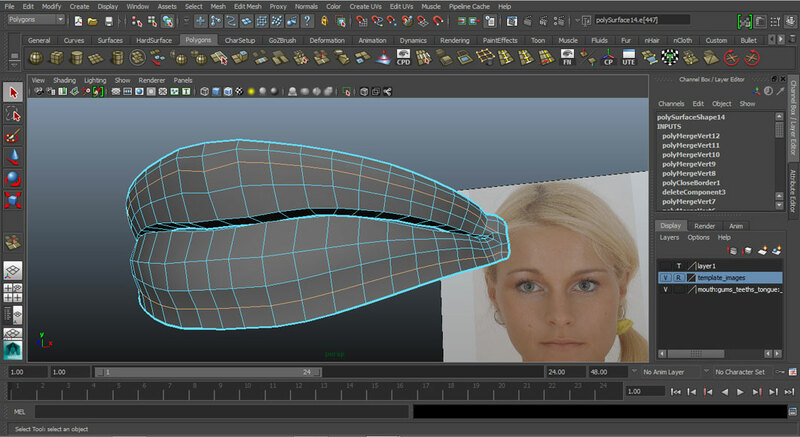 Remember that the key part is that you fix the corner of the lips so that there isn't any face overlapping. 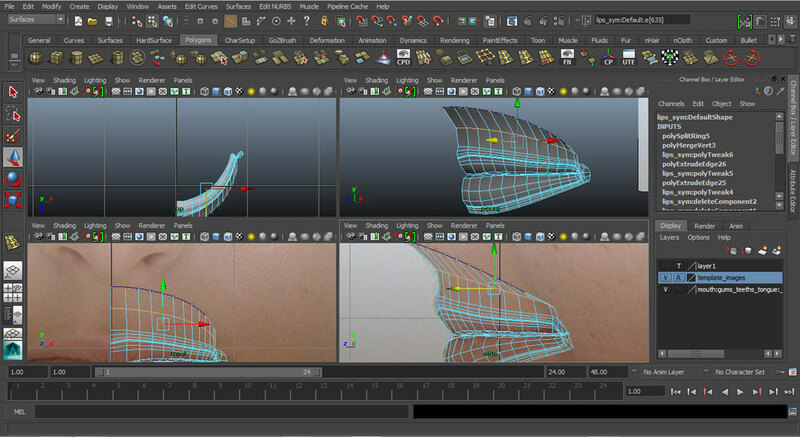 PART 3: Refining the model. 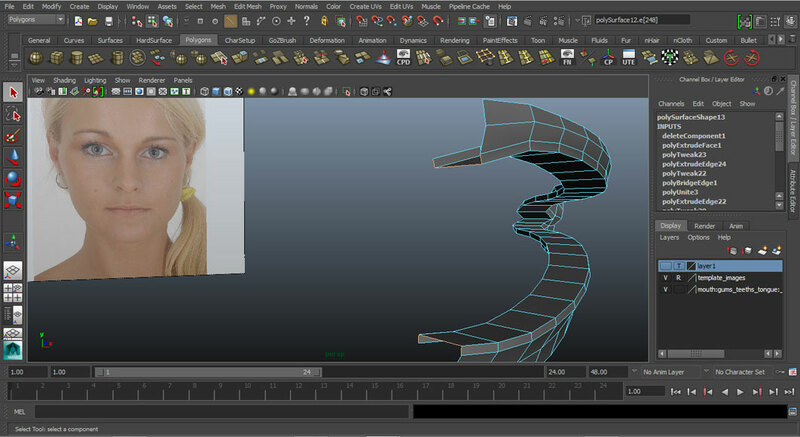 Insert a loop right in the middle of the most inner vertical faces. Look how the new loop goes through both loop edges. Now is time to refine the loop we just added. Notice that we still have a very squared shape and we need it to be more rounded; particularly the lower lip is very rounded. The upper lip is way more planar. Be careful with the shape of the lips that you are making. 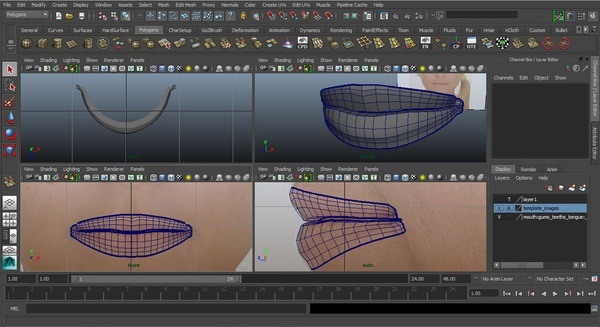 Use a polygon smooth tool if you desire. This is flesh and you don't need to be precise. 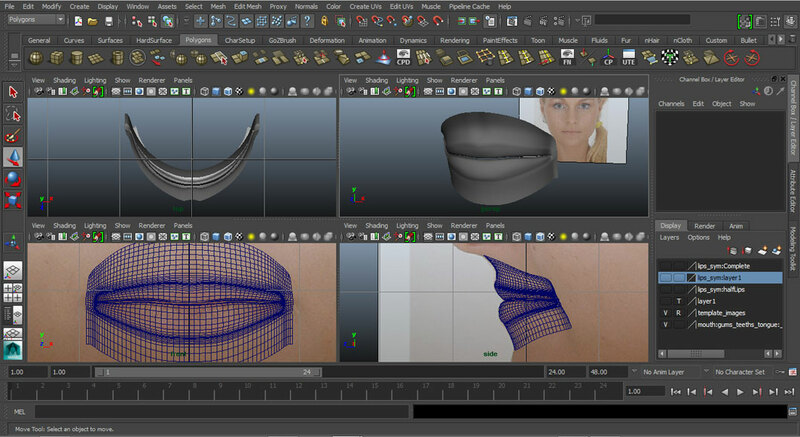 After you finish polishing the shape, mirror your lip mesh on the horizontal Axis and combine them. Look carefully at your reference images. Notice that there is a line where the lips ends and the skin begins. You should have an edge loop going through that line on the upper and lower part. If you don't, select the closest edge loop and slide it so that it goes on top of this line. In this model you will notice that the two lines do not form a continuous loop. 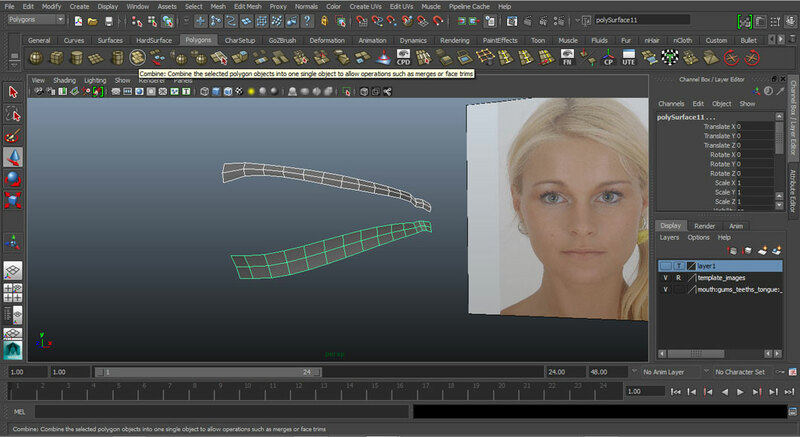 If you are modelling from a complete face, this line might be a loop. If this is the case ignore the following steps and skip to Part 4, Step 5. What we need to do now is to make those two edge lines a continueous loop. I kept the complete lip mesh and used the symmetry tool. If you want you can delete one half and later mirror and combine them again. Select the last edges on the selected loops and delete them. Use a cut polygon tool to draw a line that connects the two lines. Notice that you are creating a bunch of N-Gons and triangles. You need to fix them. If you are new it might take a bit of time or if you work in a place where the pipeline use N-Gons (like Pixar) then ignore the cleaning up. To fix the triangles simply select the 2 vertices on each corner and merge them. Now we have a continuous line. However if we select the line, it doesn't select the whole loop. We need to repeat the process we just did with the outer faces of the edges we have been working on. 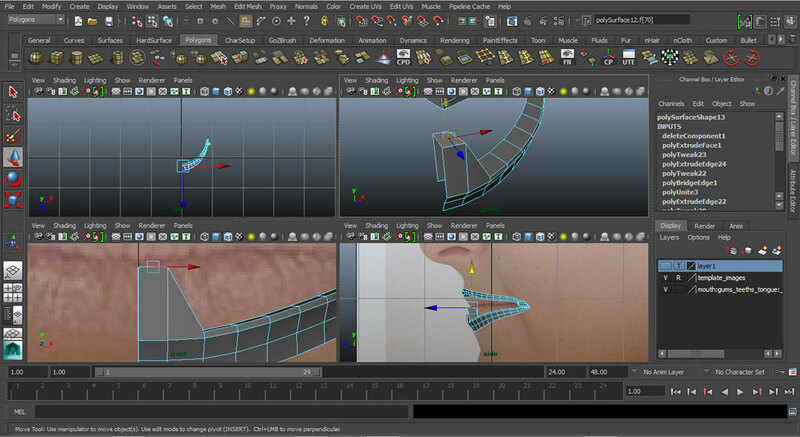 After you create the outer loop and fix the triangles and N-Gons, select the line that go across the separation from skin to lips. 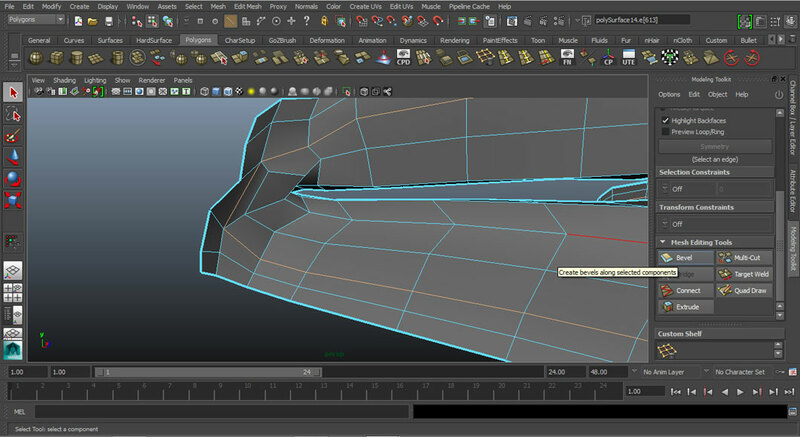 With the loop selected, bevel with a factor of 2 so you create a sharp edge. This line varies from person to person and the closer the lines are the sharper the separation will show. People of African descent usually have a sharper separation of their lips and skin. Look at your model carefully and adjust the sharpness accordingly. 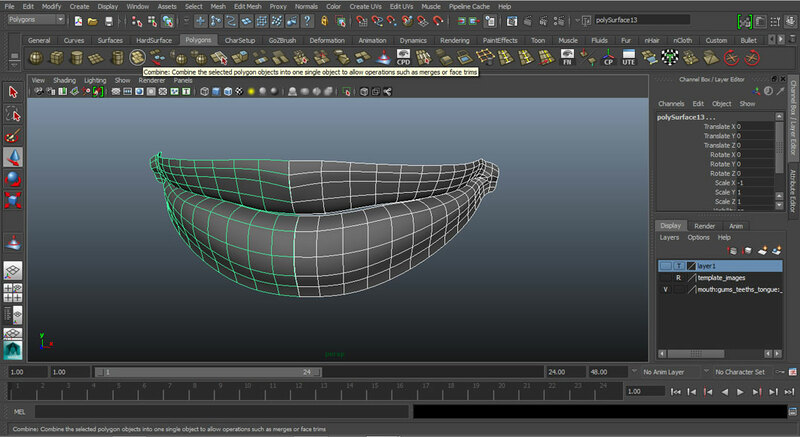 Create a new loop inside the lips. 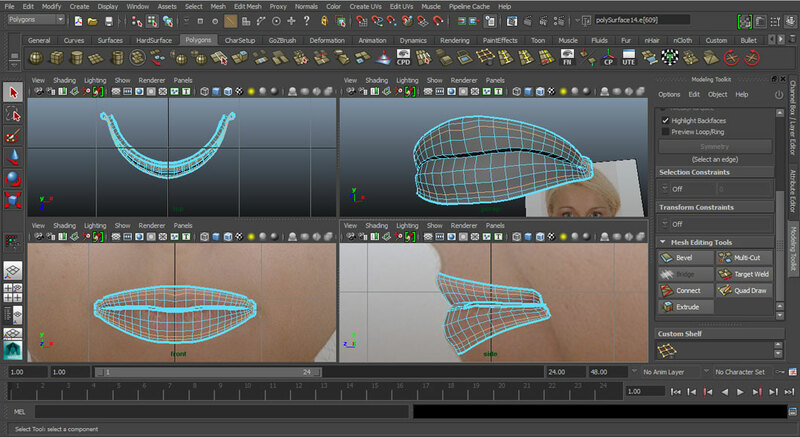 This is going to remove the last flat part of the lips. 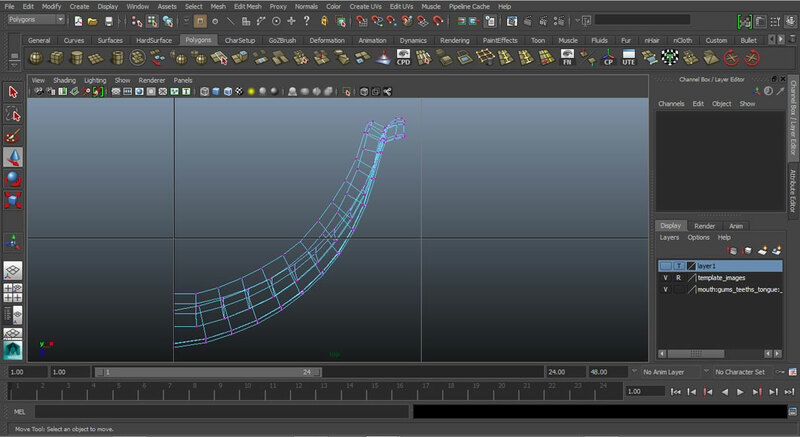 Use the scale tool in the Y (UP) axis. It should pull the upper and lower lip together. 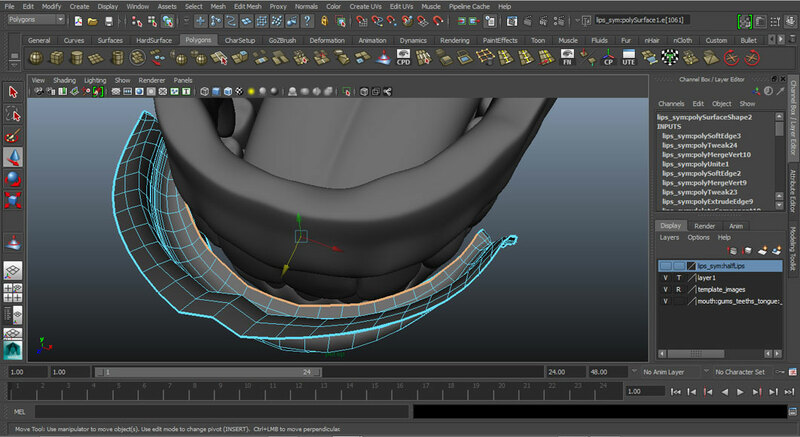 If you want to increase the separation from the lips and the skin, you can add another loop outside of the beveled loop. 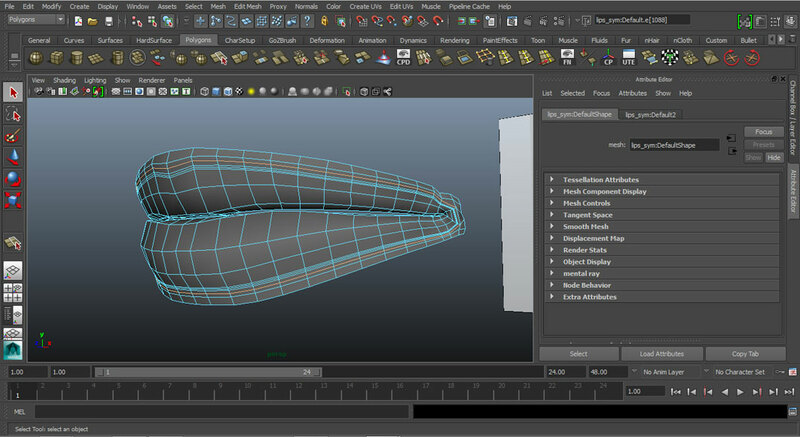 And with this we finish the lips. 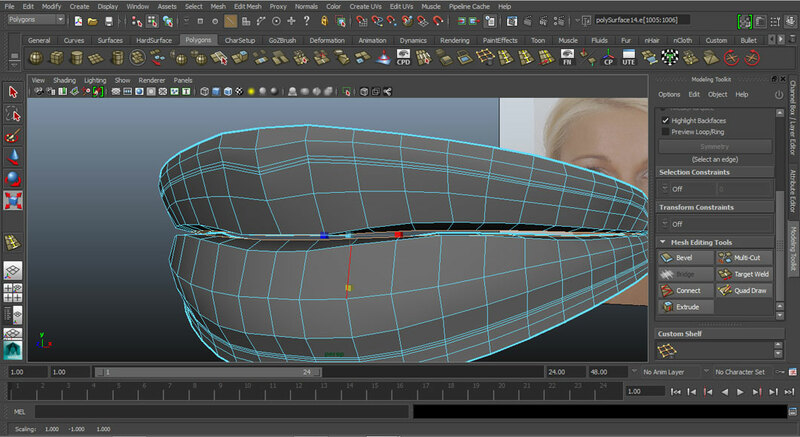 Now we are going to make the around skin and the mouth cavity. Select the top edge of the upper lip and extrude (or extend) it upward. 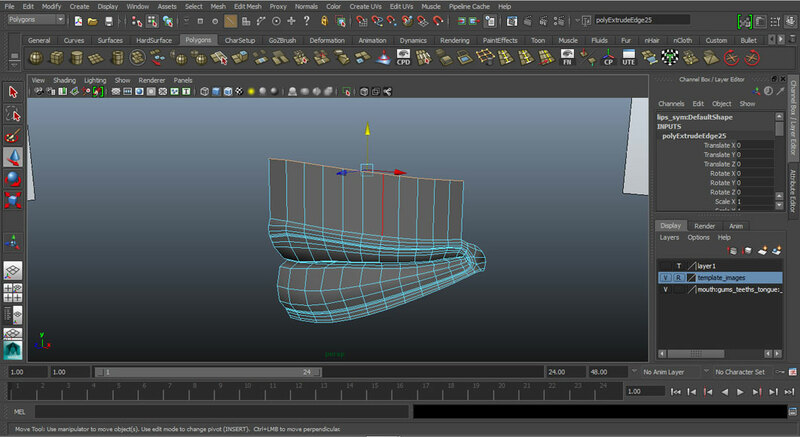 Only extrude the polygons that edge to the top. For now leave the side ones alone. 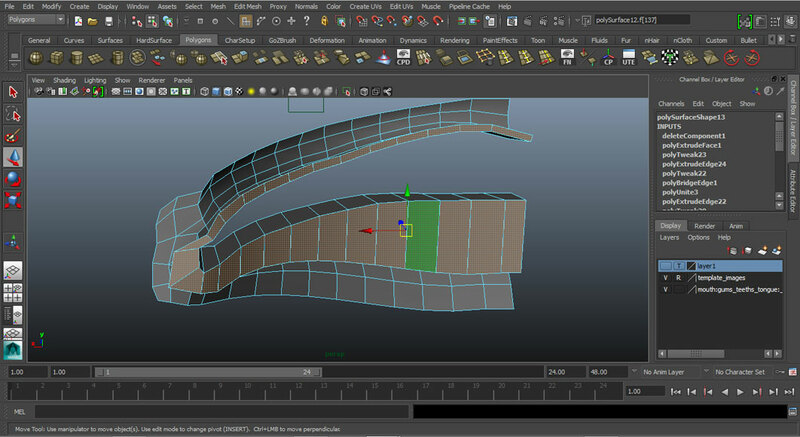 Using the side view as guide, pull the extended edges forward to match the 'moustache' area. Insert a loop in the middle of the extruded faces along the horizontal axis, then proceed to pull it backward following your model. Either bevel the loop you just created so that you have two more edge loops or simply add 2 more loops at the top and bottom of the edges from the last step. Like before, move them so that they match your model. Now repeat the process with the bottom edge of the lower lip. 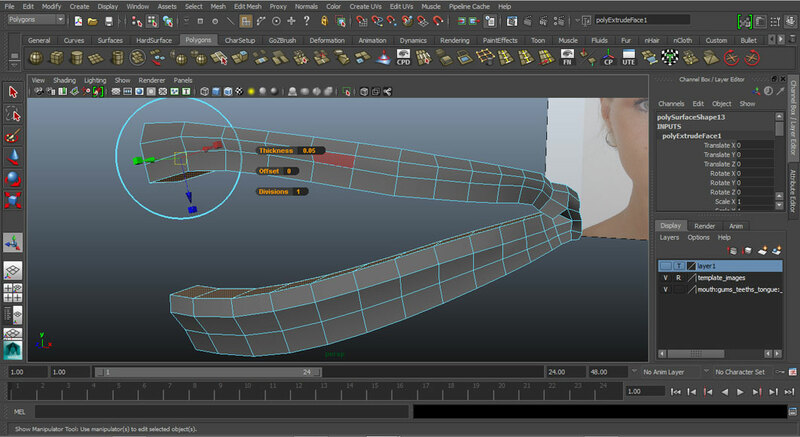 Extrude and pull accordingly to your model. 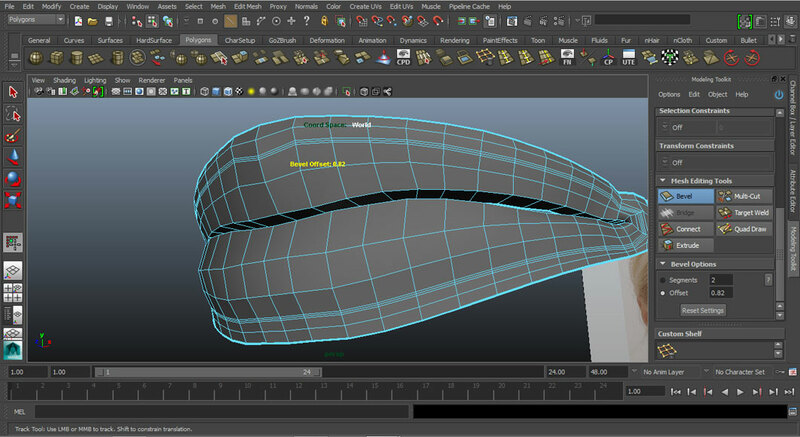 Select all of the edges that face horizontally at the outer side and extrude them. Now using your reference images move them to fit the corner of the mouth. In this case, her lips ¥sink¥, creating a depression at the lips outer corner. 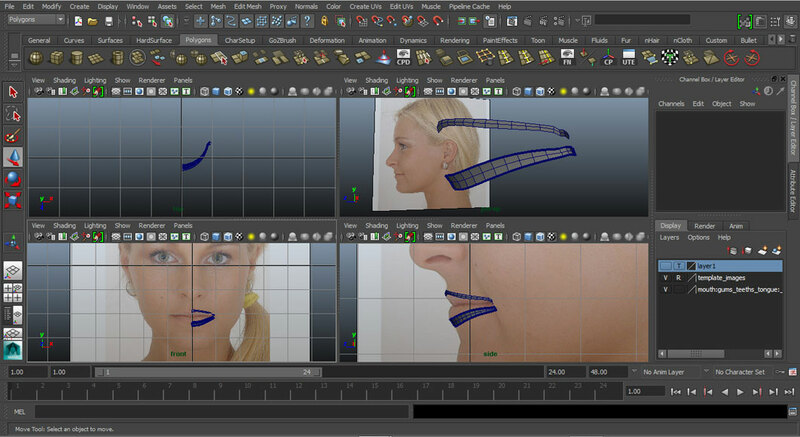 Add another loop at the bottom lip's faces that you just extruded and move it to help you refine the shape. 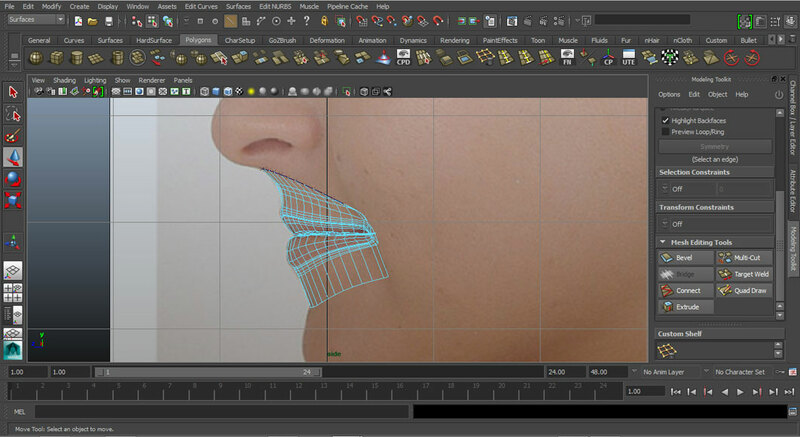 NOTE: This model's skin (under the lower lip) falls in a straight line which is very easy to model properly. However there many people who have a vertical three wave shape under the lower lip where the middle part creates a concave surface (I have that). I didn't notice that this model didn't have this when I picked her photos. You have to be careful about this area because it defines a lot of the mouth shape and creates optical illusions about its true shape. 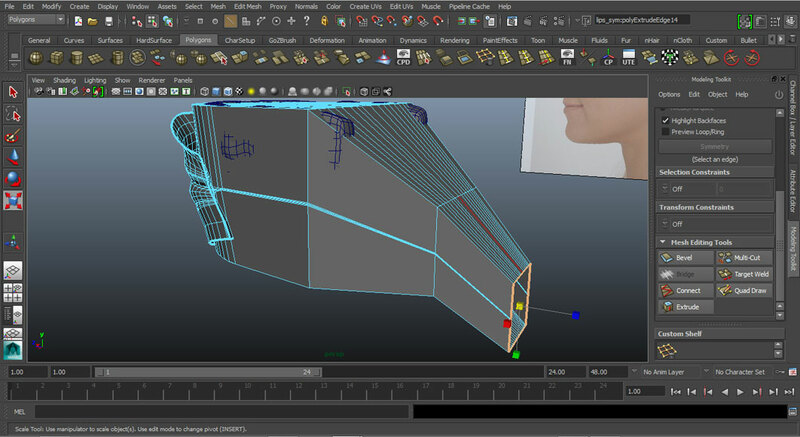 Select the center vertices above the lip and pull them backward to create the ridge that connects the nose and lips. 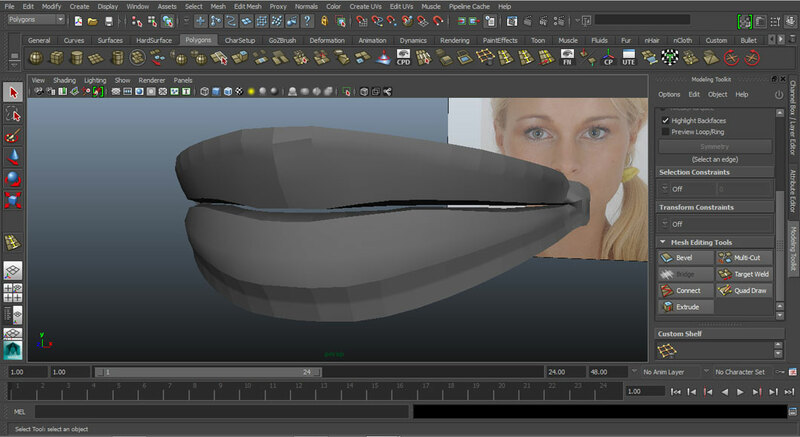 And with this we finish the skin surrounding the mouth. Next we are going to make the mouth cavity. Part 6: The Mouth Cavity. 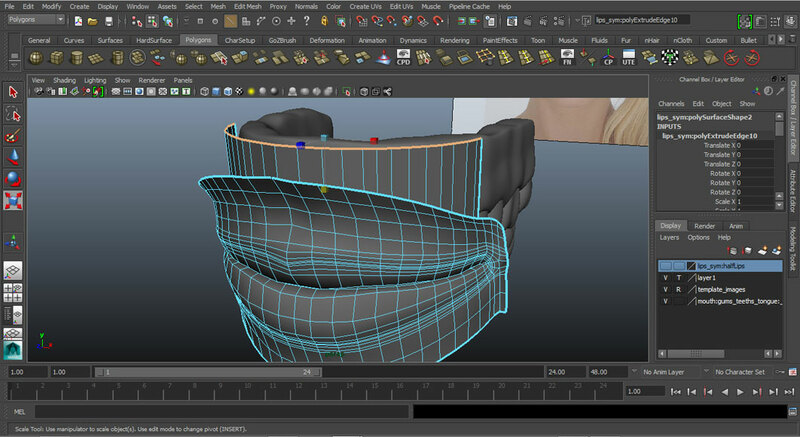 Unhide your molar model. This will be very useful (like the eye ball is) to help you get the correct shape with the correct measurements. 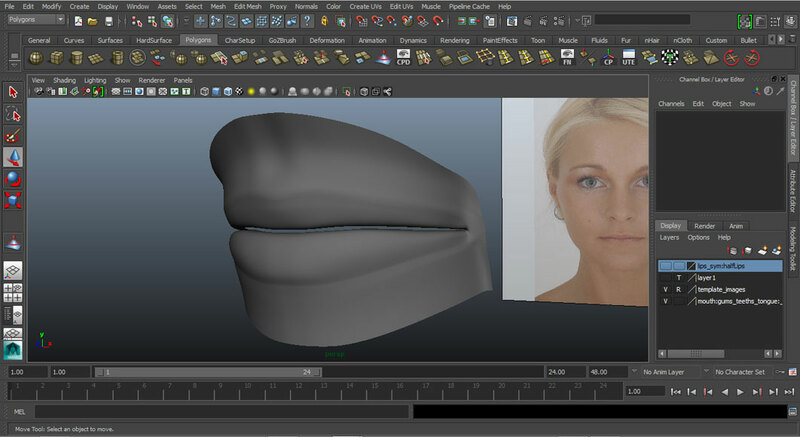 Select the farthest back edge of the top lip and extrude it upwards. 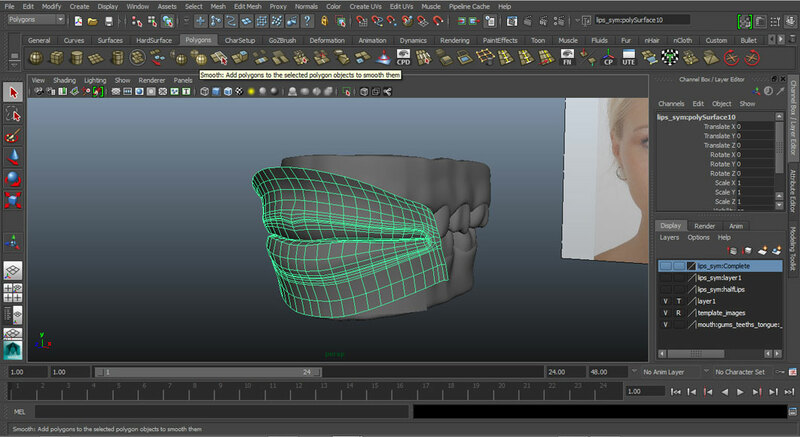 Pull the extruded (extended) edge so that it doesn't overlap the teeth. Repeat steps 1 and 2 with the most backward top edge of the bottom lip. Select the complete side edges on both sides and extrude them backward. Be careful selecting the corner edges as right now they should be very close together. Make sure you select them all. Fill the top and bottom arches of mouth cavity. Ideally you have to make it all quads but if your pipeline accepts it you can leave the N-Gons or triangulate the faces. Select the farthest edge of the box and extrude it backwards and lower like you were making the throat. Reduce the scale. Repeat the process. 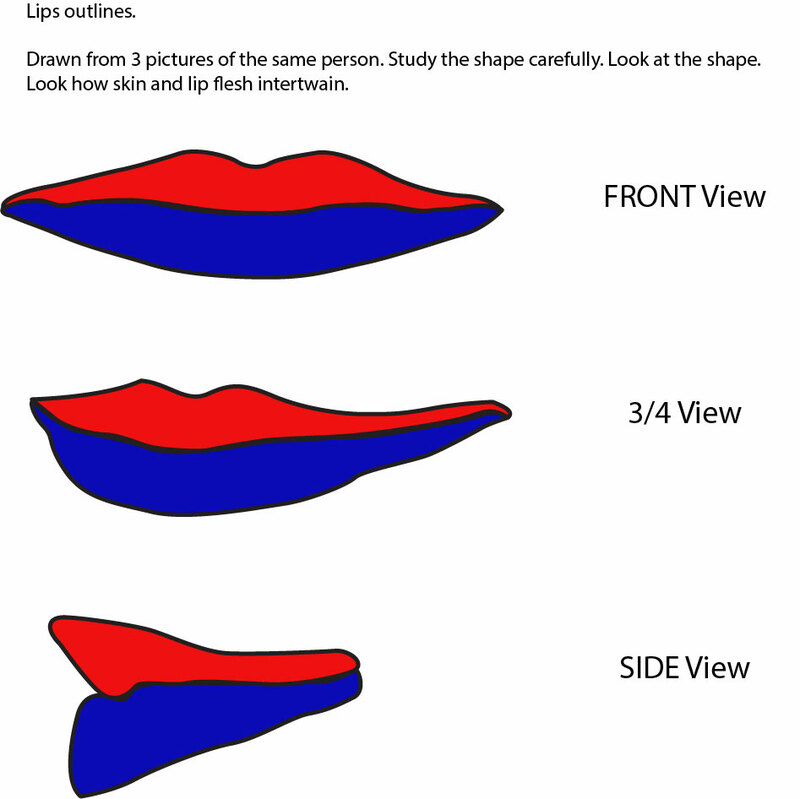 I hope this tutorial helps you out with making lips. This technique can also be applied to cartoon lips. 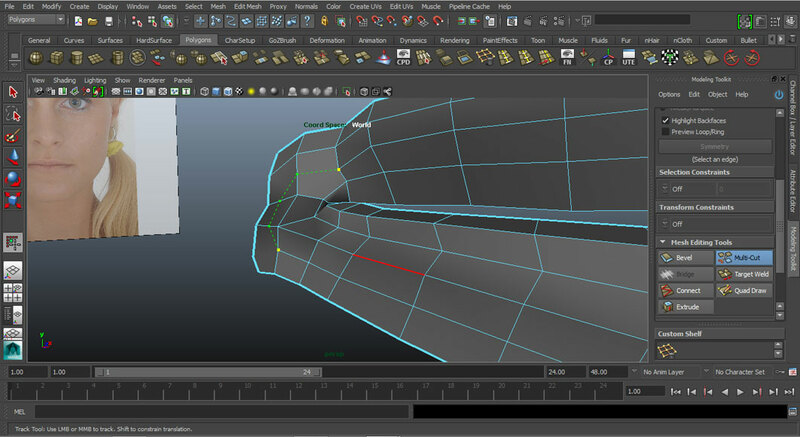 It also allows you to create a lot of detail with a relatively low geometry count. Thanks for reading.